Small impact craters usually have simple bowl shapes, but sometimes more complicated shapes can occur if the target is unusual. 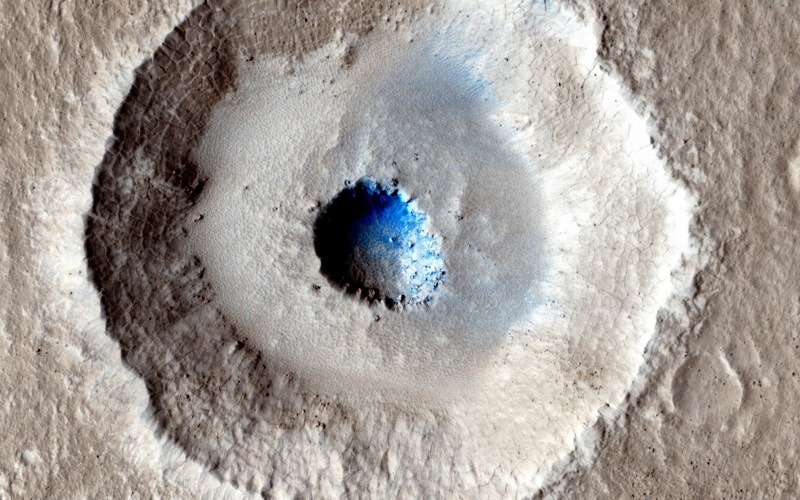 The crater in the center of this HiRISE image is unusual because there is a wide, flat bench, or terrace, between the outer rim and the inner section, making it appear somewhat like a bullseye. Crater shapes like this can occur if material underground changes from weak to strong. In these cases, the level of the terrace shows where this change occurs. In the area covered by this observation, we have other reasons to suspect that the upper material is mostly ice. Terraced craters like this one show us how thick this ice is, as the terrace formation shows us where the ice meets the underlying rock. Note: These craters are located in Arcadia Planitia.